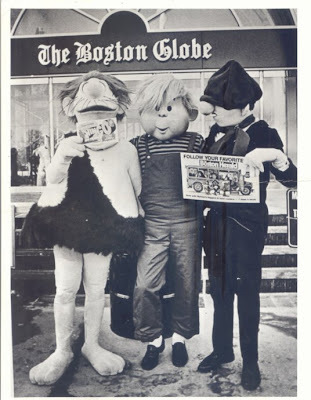 The promotional photo was taken when the Boston Herald succeeded in stealing three strips (BC, Dennis the Menace and Andy Capp obviously) from the Boston Globe. I find the Dennis character particularly disturbing. The demon-spawn of Chucky and Freddy Krueger? Yowza! That is one creepy Dennis costume! (Tho BC and Andy look pretty good) I think Dennis ranks right up there with the original Flintstones Theme Park costumes and the Archie character costumes as one of the most disturbing looking comic strip cosplays ever.